On August 21, 2017, millions of Americans will experience the first total solar eclipse in 98 years. Depending on where you are watching the eclipse from, the percent that the moon covers the sun will vary. Those that are viewing from Northern California and Nevada, including folks in the Sierra Nevada region, will experience a partial eclipse at 9:04 AM with the maximum eclipse of 83% at 10:20 AM, and the end of a partial at 11:43 AM. Tony did ease our minds that location does not truly matter (i.e. your backyard v. a grocery store parking lot). But as the multi-tasking adventurers that we are, we think that watching this historic moment in one of America’s most unique mountain communities makes it all the better. To our neighbors in Sacramento, San Francisco, Reno and more, why not play hooky on Monday to catch the eclipse while getting outside, working up a sweat or taking a rejuvenating swim? If you can’t catch more than 83% in your town, you might as well get a couple thousand feet closer! Get as close as you possibly can to the eclipse by hiking to the top of the tallest peak in North Lake Tahoe–Mount Rose. At 10,776 feet, not only will you get a solid workout in, but you’ll also get a bird’s eye view of the lake, 360 degrees of panoramic splendor and be front row to watch history in the sky. The Mount Rose Summit Trail is an even 10 miles of hiking, has under 2,000 feet in elevation gain and is incredibly scenic along the way. 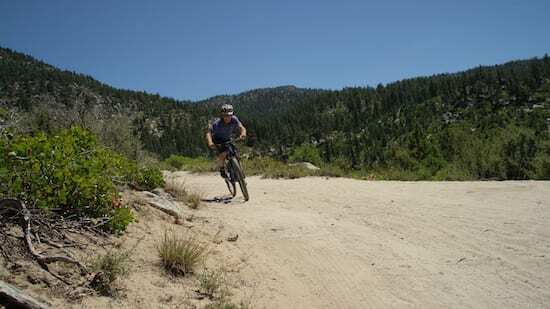 Track the sun (and the moon’s shadow) as it moves across the sky by mountain biking along the iconic Tahoe Rim Trail. This diverse track offers multiple drop-in spots depending on what type of ride you’re feeling. From single track to sweat-inducing climbs, stunning lakeside views and exhilarating descents–this trail may actually distract you enough to miss the event entirely. We suggest loading up on snacks ahead of time and pulling over for a well-deserved water and eclipse break. How often can you say you’ve done that? If you’re in town with your squad or family, claim your spot on the beach early and spend the day playing in the sand, BBQing or splashing around on your favorite floaties. 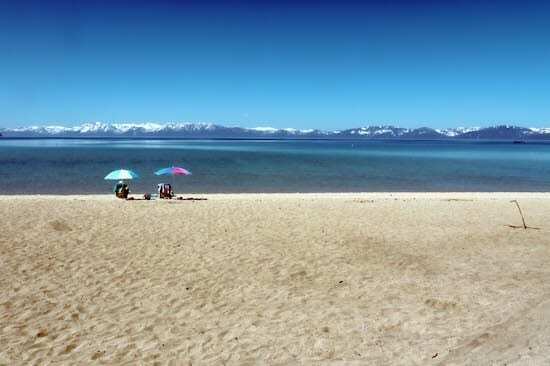 For big groups we recommend checking out Sand Harbor State Park on the East Shore, Kings Beach Recreation Area or Commons Beach on the northernmost shore and Chamber’s Landing on the West Shore. If it’s just you and a friend (or your furry sidekick), venture down to one of Lake Tahoe’s smaller coves, like Skunk Harbor, Hidden Beach or Chimney Beach. 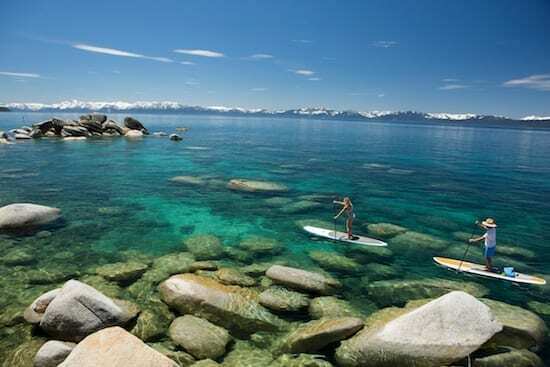 Ditch the roads and the shoes and hop on a stand up paddle board or kayak and venture out onto the glassy water of Lake Tahoe. If you’re not one of those #vanlife travelers rocking all the gear you could ever want (we’re just jealous), pick up your equipment from West Shore Sports and paddle up to Chamber’s Landing, or Adrift Tahoe in Kings Beach where you can try locally-crafted SUPs made just for Lake Tahoe. 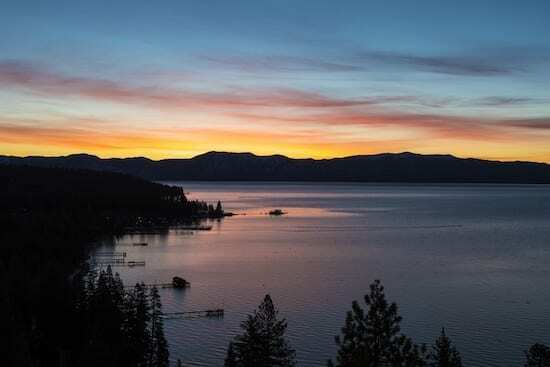 Whether it’s the total eclipse of the sun or your total eclipse of the heart that pulls you and your loved one to Lake Tahoe, we’re sure you’ll find something magical to do together. 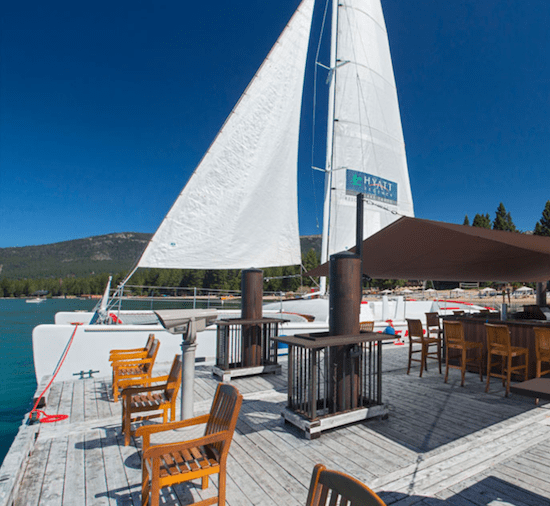 Enjoy brunch on the adorable patio of Log Cabin in Kings Beach with a few Seabreeze Mimosas followed by a game of old-school mini golf, or a private boat cruise from Action Water Sports or Tahoe Sailing Charters. Spark your romance while playing hooky and live in this moment that we’ve been waiting for for 98 years. If you’d rather leave the work up to the sun and the moon, sit back and relax in the lakeside chairs of Pier 111 at The Hyatt Regency Lake Tahoe Resort, Spa and Casino with a well-deserved Bloody Mary, or take the Aerial Tram at Squaw Valley to catch the last 45 minutes of the eclipse from 8,200′ at the High Camp hot tub and pool (tram starts running at 11 AM). No matter how you choose to watch the eclipse, we think you deserve to do it in more style than simply walking out your door and looking up. Dive into a full body sensory experience with 360 degrees of outdoor splendor and miles of vertical adventures that bring you even closer to the sun. While experiencing the eclipse in all its glory on Monday, August 21, be sure to tag North Lake Tahoe on social media with #tahoenorth and @TahoeNorth. See you, adventurers, out there!